Q: My total labor percentage including taxes runs between 36-40 percent each period. I understand this is normal, but I can’t afford it any longer. What are some ideas to help bring that number down? Start with the right numbers. Total labor including taxes needs to be closer to 30 percent than 40 percent. The lower your cost of goods, the more flexible this number can be; generally, 30 percent all in is a good number. To hit 30 percent, hourly labor needs to be around 20 percent, and management around 5 percent as taxes and benefits will range between 15-20 percent of wages. The higher the management percentage, the lower the hourly percentage and vice versa. Before the next period begins, cost out what the business needs without employee names attached. Total the number of hours and multiply the average hourly rate for both front and back hourly employees, add management wages, then divide the sum by projected sales. If the starting point is above 25 percent, go back to scheduling around the business to drive the maximum sales during busy times by having appropriate sales producing staff and minimizing labor in the slow times. Tighten up hours of the day that are low revenue and high labor. Use scheduling software effectively. In this era, where the average restaurant is spending more than $350,000 per year per million in sales on labor, the investment of $2,000 or less per year for scheduling software is a bargain. Often, the use of scheduling software will reduce cost by 3-5 percent of sales, as it will provide the scheduled labor dollars and percentages prior to starting the period to ensure targeted labor percentages can be accomplished. Labor dollar seepage starts with early clock-ins and late clock-outs. It’s simple. If the spend is $1 for six minutes of time, 10 people clocking in six minutes early and clocking out six minutes late will cost $20 per day. That’s more than $7,200 per year. Scheduling software can provide reports showing who is clocking in and out early or late and how often. Besides tracking time in and time out exceptions, scheduling software will also pull sales data daily and match it up to the scheduled amount showing exceptions. For example, if a schedule was written for $4,000 in sales and $800 in labor, and actual was $3,000 in sales and $850 in labor, you know there were issues with phasing the crew. Start fast, stay fast. A body in motion stays in motion. A body at rest stays at rest. When an employee arrives at work, make sure the work is ready, and manage those minutes at the start of the shift with diligence. The faster the start, the faster the performance. The goal is to increase productivity daily. Matching busy times with the most productive, fastest people produces the best set of results. Match sales by 15 minutes to the actual employees working every 15 minutes. See exhibit 1. 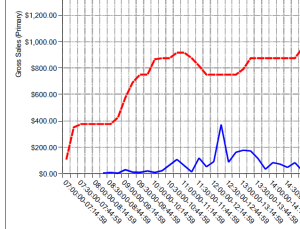 In the example chart with sales in blue are charted on one axis, labor hours in red on another, it’s clear when there is a sales spike, there is a labor reduction. It’s also clear that the staff is starting too early. Much of this type of behavior is due to prep. Prep hours need to move closer to the sales spikes, and those individuals need to jump on the line and help when the rush hits. To keep labor dollars from slipping through your fingers, start with the right numbers, use a labor scheduling tool and manage the schedule to speed of performance. Do this and you’ll see those labor numbers come into line. For more information on improving profitability and driving performance, contact AMP Services at rbraa@ampservices.com. Rick Braa is the co-founder of AMP Services, an accounting and consulting firm specializing in helping companies grow profitability. Q: I’m currently working hard on bringing my costs in line. What are some areas below prime cost on which I can focus? Q: I’ve been in the restaurant business for 20+ years. Over the last several years, I’ve seen our financial margins decline year-over-year, while sales have improved slightly. Other restaurant owners I speak with are losing margin as well. What is happening to our margins as an industry? A: Not too many years ago, the profitability formula for an average restaurant was 30 percent cost of goods, 30 percent labor cost and 30 percent other costs, leaving 10 percent as the bottom line. Through the years, with a steady increase in minimum wage and a tight, competitive labor market, the most common model is now 30 percent/36 percent/30 percent. Net income of 4 percent is the average bottom-line margin. The restaurant business is difficult and a all-run, balanced business includes an intense focus on the guest, wonderful work environment, careful planning, sparkling clean facility and excellent financial results. Focus must be applied in each area with equal vigor and, most importantly, the owner must compete with him/herself to be his/her best in each area. The journey to improving financial results begins at top-lines sales. Manage sales mix aggressively. Increase the sales mix percentage/number sold of starters and desserts to entrees. Entrees sell regardless; starters and desserts don’t. Track the last several months of the percentage of total sales and the number of starters and desserts. Coach the team on the importance of offering these options with every table, and make sure the team is proud of what they offer. Run contests to reward behavior, and track and post the results daily. There are two big wins by driving the beverage sales higher. Food sales stay the same, yet overall sales grow incrementally – in this case by $5,200. Secondly, beverage sales are more profitable than food sales. Beverage typically has a better cost of good than food, and it takes no more labor to produce and sell another beverage. Drinks are sales that must be offered and carefully managed with proper pace. With safety in mind, be sure to offer to “refresh or refill” glasses when the guest is about one-third from finishing the drink. That allows the bar and the server to get the drink to the table on time. After building a solid sales strategy, move on to the most important cost equation of the P&L. Combine cost of goods and fully loaded labor to compute prime cost. Prime cost is the most important number to manage in the restaurant. Manage it as a whole first, then break down the parts of cogs and labor. If the new “normal” is 66 percent (cogs 30 percent + labor 36 percent) set a standard of 60 percent or better (55 percent is optimal). Upon first examination, a six-point improvement may seem impossible, but it’s entirely possible. I’ve been involved in companies dropping 12 or more points out of prime cost with focused management and strategy. It’s necessary to have a strategy for the menu and labor, both of which could fill books to adequately explain. Focus on the relationship of menu items, driving sales and labor efficiency. Push cost-of-goods-sold toward 25 percent through effective pricing, menu engineering and sales mix. Target labor at 30 percent or better. Target front of the house at 8-10 percent; target the kitchen for 8 percent to 10 percent; aim for 5 percent or 8 percent for management and a 15 percent load on labor for taxes and benefits. As sales grow, allow only 5 percent more labor for front of the house, 5 percent for back of the house and zero for management for each $1 of incremental sales. This way, as sales grow, labor won’t grow at the same rate. Be sure posted schedules match labor goals, provide plenty of coverage during busy times and minimize risk to the shoulders of the rush. Competing for margin is mindset and discipline, giving up margin is voluntary. Spend time daily challenging the status quo, and focus on changing sales mix and prime cost; yo’ll recover that margin to live better life.